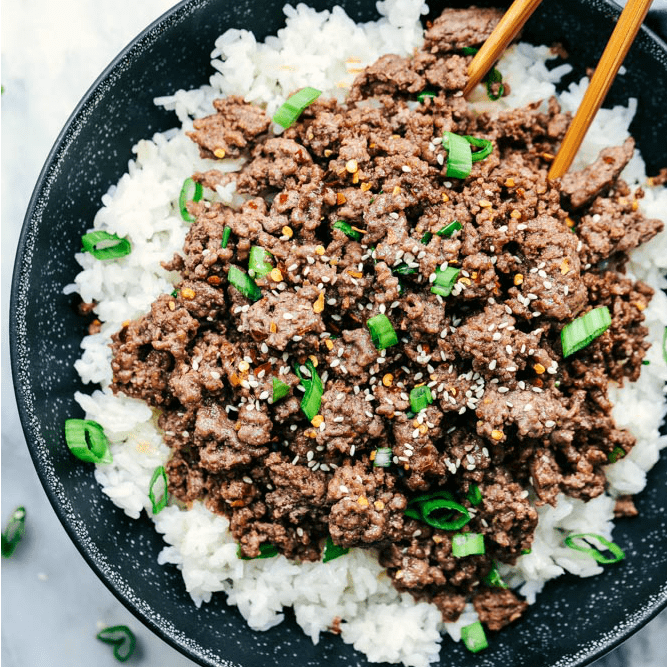 Korean Ground Beef and Rice Bowls are so incredibly easy to make and will become a family favorite! This makes the perfect weeknight meal. This right here is my boys favorite weeknight meal. They beg me to make it every week. Since we have been so busy with Lacrosse we have been having it every week. It requires minimal ingredients and requires little effort to make. Easy, minimal ingredients, and my kids devour it. This meal became my new BFF. 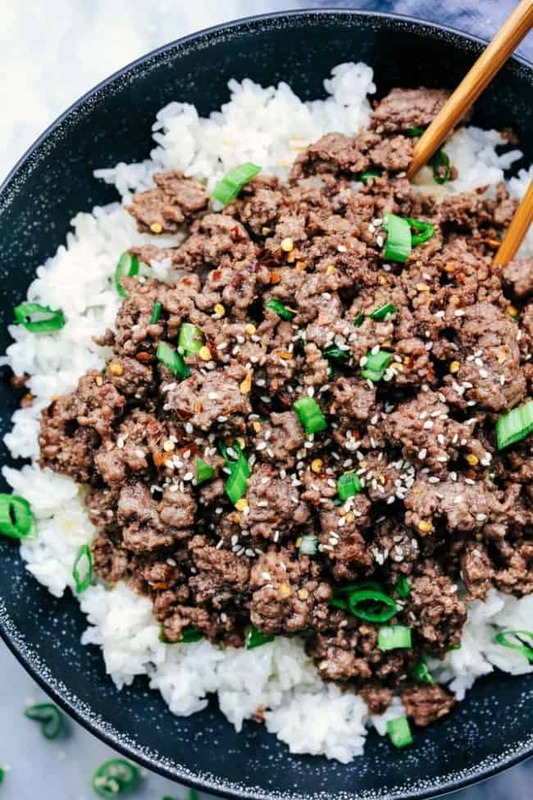 The ground beef takes only minutes to brown but you still get that delicious Korean flavor in this meal. The brown sugar, soy sauce, sesame oil, and ginger combination is the best. It helps take the flavor to next level with the simple kitchen ingredients. The best part is that because we love Asian flavors so much I always have these ingredients on hand. All I have to do is buy a pound of ground beef each week. You guys are going to love this meal just as much as we do! It is so delicious when served over rice and I even like to add some veggies to my bowl to make it a well rounded meal. Sprinkle with some sesame seeds and freshly chopped green onions and you have about the easiest meal that you will ever make! You will make this again and again! Try it with a fried egg on top of each plate – the runny egg yolk over the beef and rice is uh-MAZ-ing!!! I also try to throw in whatever veg I have on hand (broccoli, bok choy, sugar snap peas, carrot strips, or spinach). I make this weekly now! Have you ever tried freezing it? I think it would freeze ok! If it needs a little moisture, add some water when heating back up. Do you have the nutritional data on this recipe? I like to use skinny taste.com or myfitnesspal.com for any nutritional values. Hope that helps you find what you are looking for! 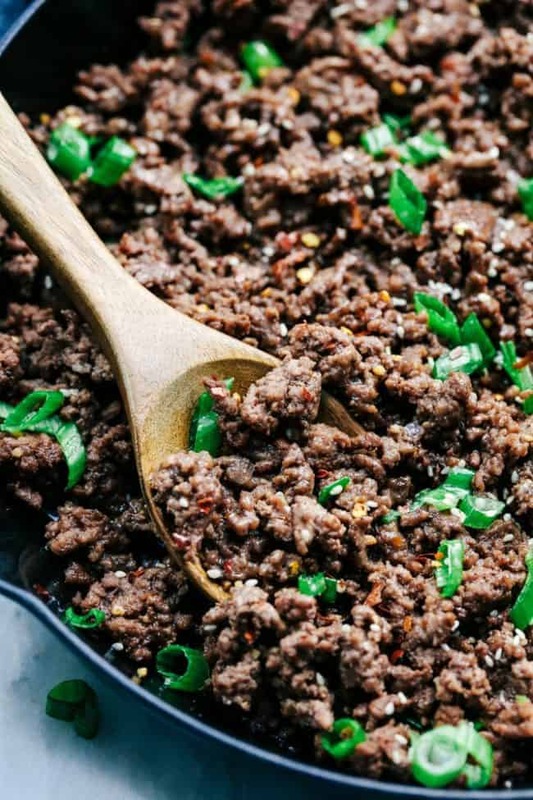 Do you know how to turns out if you only have 80/20 ground beef? Will it still turn out okay? Thank you! That will be great too! Enjoy your Korean Beef! I’ve made this a few times now, with ground chicken and ground pork. Both were delicious! Also took Holly’s advice and added spinach and bean sprouts. Looking forward to trying the fried egg next! Turned out really great with minor adjustments- no garlic and fresh ginger. Stir fried some zucchini and broccoli as a tasty side. We’ve made this recipe multiple times now and the flavors are amazing!! I was curious what kind of ground beef you typically use? We found ground sirloin made it much more flavorful compared to regular ground beef. MMM! The ground sirloin is great! We usually purchase our ground beef from the local butcher close to our house. I will have to try ground sirloin! That sounds delicious! Thank you for the tips! Made tonight & a huge hit with husband & our 9yr old son! The only thing he asked I do differently next time, is more sauce. He’s a sauce guy ….the flavors are so good & such a quick and easy meal!!! Dinner time is a disaster in my house most nights. The kids never like the same thing at a time and I refuse to cook multiple meals to cater to everyone. EVERYONE ATE AND LIKED IT. Excuse me while I go cry tears of joy. YAY! That is awesome! Way to go! I am so glad that it worked out and you have happy tears! Thank you for following along with me! Could I use thick soy sauce? 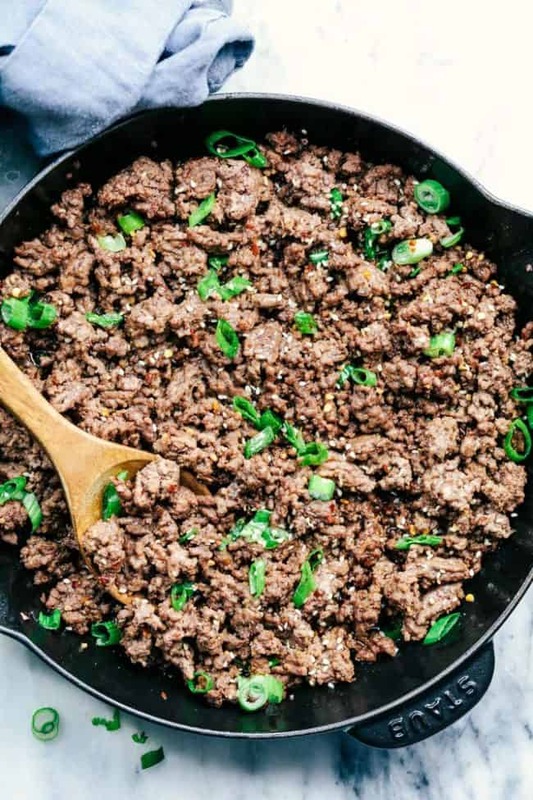 If using 3lbs of ground beef instead of 1lb ground beef, would you recommend using 3 times each ingredient for the whisked sauce? Yes! The more sauce the better ;)! This looks great! Ground beef is our primary source of red meat; we try to do all grass fed and organic, but typically cuts other than ground beef are too expensive for a regular rotation. Always looking for a way to mix it up! We love burgers, tacos, shepherd’s pie, but a change is always good – and we love Asian flavors as well! Adding this to the menu for next week, thank you! Could you make the beef ahead of time and refrigerate it overnight? I’m hosting a bunco night and it’d be awesome to have everything ready to go the day before! Yes, that sounds like a great plan. Enjoy your game night! That will be fun and yummy food;)! Can you use ground turkey instead? Yes, that sounds delicious too! Let me know how it turns out! This was so yummy. I made this for my husband and picky 18 yr old. They both Loved it! Besides the taste, I loved how easy this recipee was. It truly only took me about 15 minutes to cook. When does that ever happen? Never. It seemed almost to good to be true. This is the first recipee I have tried from your site and look forward to trying more. Thank you. How do you reduce the soy sauce? Or is it readily bought in store? The soy sauce is already pre-made in the store. You are welcome to make your own soy sauce if you prefer to change the ingredients in the recipe. Subbed brown sugar with coconut sugar. Was still delicious. Thanks for the recipe! Loved it. Simple and fast yummy dinner. Made exactly as written. Oops except the red pepper flakes. My kids a chicken of hot! My 12 year old son requests this regularly. I usually make it with beef, but tonight I tried ground turkey. We loved it. Thanks for a great recipe. I’m usually not as crazy about the “5 ingredient dinners” because they usually end up lacking for me, but this was so much better than I expected. I used 5 cloves of garlic instead of 3, added fresh ginger instead, and used a jalapeño as well (since I needed to use it up anyways) and it taste just like spicy beef you would get at the mall. It’s really cheap and easy to make, and without any changes I think it would still be great! 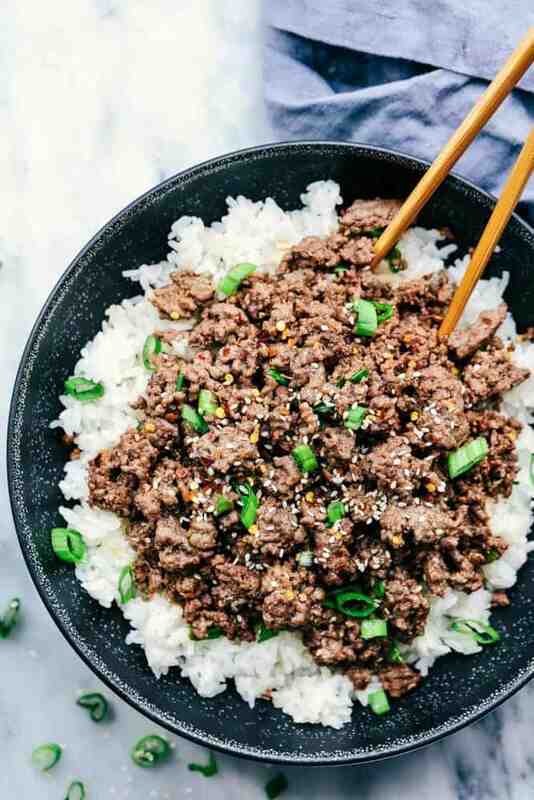 The Korean ground meat and rice bowl was so easy, yummy, and very forgiving to alterations; i.e. chopped onion for green onion and vegetable oil for sesame oil. I’ve already sent the recipe to many of my friends. I make this about once a week and I still love it. Thanks for the recipe! I have everything except Ginger. Will it taste the same without ginger?? Yep! It will still be amazing!